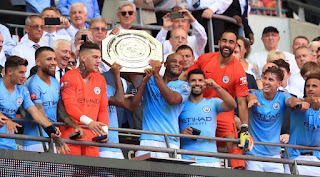 Vincent Kompany has warned Manchester City's rivals that the Premier League champions won't rest on their laurels as they aim to follow their record-breaking season with another title triumph. Pep Guardiola's side swept to the title last term with a record 100 points, amassing more wins and scoring more goals than any previous champion in the Premier League era. Inspired by Kevin De Bruyne, Sergio Aguero, Leroy Sane, Raheem Sterling and David Silva, City's eye-catching style earned comparisons with the finest teams in English football history. "Before saying anything or doing anything, you want to observe and see if you see the same mistakes which we've done previously," Kompany said. "I've got to be honest, there was a feeling when we've won the league previously, you came back in to the training sessions and everybody was a little bit less intense, a little bit more smiles and happiness, but a little bit less committed. "Teams that actually wanted it more could hurt us. I came in to training this time and it's completely different." With Guardiola saying he is still "starving" for more success, there appears to be little chance of a City letdown. That was the perfect preparation for Sunday's Premier League opener at Arsenal and Kompany added: "Number one, we realise this is precious and we want to hold on to it. "Number two, we went into the game with Chelsea - we lost two Community Shields before - and this was a strong Chelsea team. We played really well against them and that, for me, is a great sign."